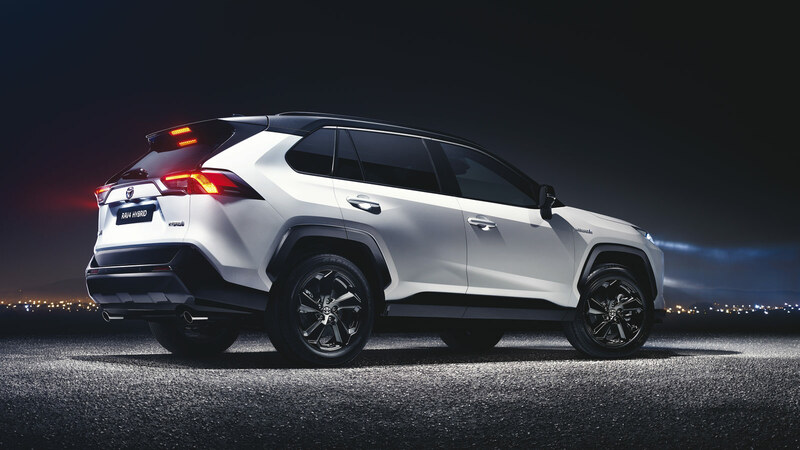 From new multimedia technology to smarter all-wheel drive and a more efficient hybrid powertrain, the fifth-generation Toyota RAV4 is brimming with high-tech that works seamlessly and conveniently to deliver a rewarding driving and ownership experience. The technology show starts when you step into the RAV4. On Adventure, Limited and XSE grades, the 7-inch TFT speedometer can be switched between analog and digital displays, letting the driver set the mood. The Multi-Information Display (MID) is upgraded to 7.0-inches, versus 4.2-inches in lower grades. Through new multimedia technology, RAV4 connects with its driver’s lifestyle as never before. Every 2019 RAV4 model is equipped with Amazon Alexa and Google Assistant capability and Entune 3.0 Audio, a comprehensive system that includes 6 speakers, 7.0-in. touchscreen, AM/FM, Scout GPS Link Compatible with up to 3-year trial, Siri Eyes Free, Apple CarPlay Compatible, aux. port, USB media port (plus four additional USB charging ports on XLE and above), hands-free phone capability, advanced voice recognition and music streaming via Bluetooth. Toyota Connected Services include Safety Connect with 3-year trial and Wi-Fi Connect Powered by Verizon with up to 2GB within a 6-month trial. The XLE grade can be upgraded with Entune 3.0 Audio Plus, which adds an 8-inch touchscreen and SiriusXM Radio, plus Toyota Connected Services/Service Connect with a complementary 3-year trial. Optional Technology Packages vary by grade, adding Intelligent Clearance Sonar with Rear Cross-Traffic Braking on the XLE, and then also expanding to the new Digital Rearview Mirror and Qi-compatible wireless smartphone charging on higher grades. For the Limited grade, which already has some of those features, the available Advanced Technology Package includes the Smart Key System on all doors and height-adjustable, foot-activated power liftgate with jam protection, Bird’s Eye View Camera with Perimeter Scan, Overhead 360-degree view in drive and reverse, and curb view, plus Qi-compatible wireless charging. All-wheel drive (AWD) may have become a ubiquitous term in the automotive industry, especially among SUVs, but not all AWD systems are the same. Toyota took a smarter approach to a technology that many might not even think about. The result is additional effective traction for inclement and slippery weather and trails, while reducing AWD’s typical drag on fuel economy. Standard on AWD-equipped Limited gas and Adventure grade models, Dynamic Torque Vectoring is added to the AWD system, which uses special couplings to manage torque distribution between the left and right rear wheels. As a result, should one rear wheel lose contact with the surface – during trail driving, for example – torque will flow to the grounded wheel to help keep the vehicle moving. In driving situations where AWD is not needed, Rear Driveline Disconnect uses a ratchet-type dog clutch to disengage the rear wheels and stop the rear drive shaft’s rotation. That reduces the energy needed to propel the vehicle, therefore helping to reduce fuel consumption. The driver can select Mud & Sand mode for beach driving, or Rock & Dirt mode for trails. Using the Multi-Information Display (MID), the driver can view torque allocation and slip control, which will fluctuate depending on driving and road conditions. Capability to detect a preceding vehicle or pedestrian in daytime or with better low-light recognition capabilities, or daytime bicyclist (new). System will alert the driver with audible and visual warnings and/or apply brakes to help mitigate or avoid the collision in certain cases (using Forward Collision Warning (FCW), Brake Assist (BA), and Automatic Emergency Braking (AEB). For highways/freeways only, LTA can be enabled when using DRCC and has the capability to recognize white or yellow lane markings or the path of a preceding vehicle if lane markers are temporarily unavailable. It can also identify and actively track the center of the lane by providing steering assistance (hands-on, driver-assist system). This reduces driver burden and helps support safe driving, especially in traffic congestion on long highway trips. The LTA system can be turned on/off. Capability to identify certain Stop, Yield, Do Not Enter and speed limit signs and signal driver with visual and audible alerts. The alerts vary based on sign type and are shown on the Multi-Information Display (MID).